Price: $ $9.95 Here is the link to buy this map from the Gem Trek website. Grid Lines: Lat/Long marks every degree in the margin. Folded road map. Scale 1:600,000. Full colour on both sides. printed on paper. Gem Trek’s Southwest Alberta & Southeast British Columbia map meets the needs of visitors looking to explore the regions east and west of the Canadian Rockies, including the Kootenays of British Columbia, the Alberta foothills, and west-central Alberta. All the major highways are shown, as well as national and provincial parks and wilderness areas. The map also shows lesser-known back roads, and pinpoints the location of lodges, campgrounds and hot springs. Mileage charts on the front and back provide distances between major towns and cities. This two-sided map divides the region into two halves. Although we’ve used the moniker “southwest Alberta,” this map extends as far north as the provincial capital of Edmonton, which is roughly in the geographical centre of Alberta. 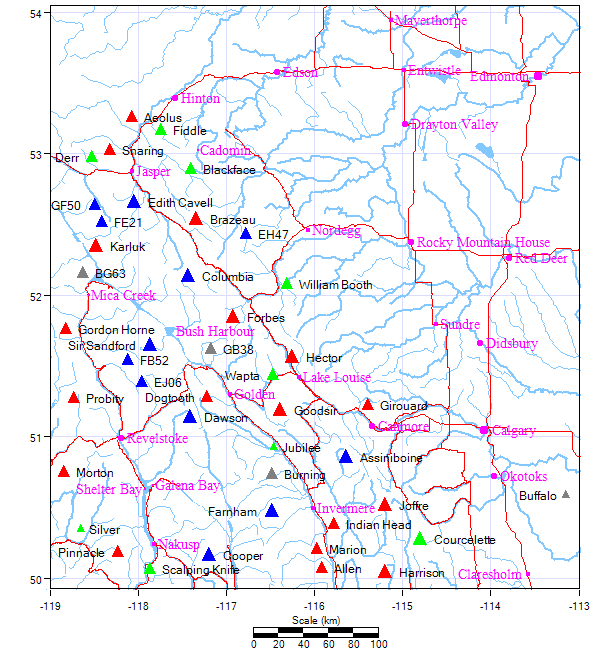 On this side of the map, coverage extends west to Jasper National Park and south to Saskatchewan River Crossing and the Alberta towns of Crossfield and Carstairs. The reverse side extends from these same towns south through Calgary to the southern Alberta town of Fort MacLeod and the U.S. border and west to Banff National Park, Glacier National Park on the Trans-Canada Highway and as west as the British Columbia towns of Nelson and Castlegar.